I thought I would share a little fun news. 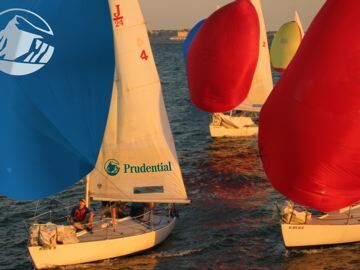 In my off time, I sail and this year I was able to get Prudential Real Estate and Relocation i.e., 'Corporate' to sponsor my sailing team - America Blu. America Blu is a 501C-3 that offers a free racing clinic targeted to women who want to advance in competitive sailing in addition to racing on Tuesday nights in New York Harbor. I started sailing in my 20's when I moved to NYC and just wanted to be outdoors. It's a male dominated sport and it was really difficult to find a path from novice to competent sailor. I found my way but then decided to start America Blu to pass it forward. I am now the team captain and driver. It's a great way to connect with others if you are new in town. It develops teamwork and leadership skills and it's a great way to stay active. For those who commute by ferry to NYC, look for my boat on Tuesday nights starting after Mother's Day. We will have a Prudential branded spinnaker.